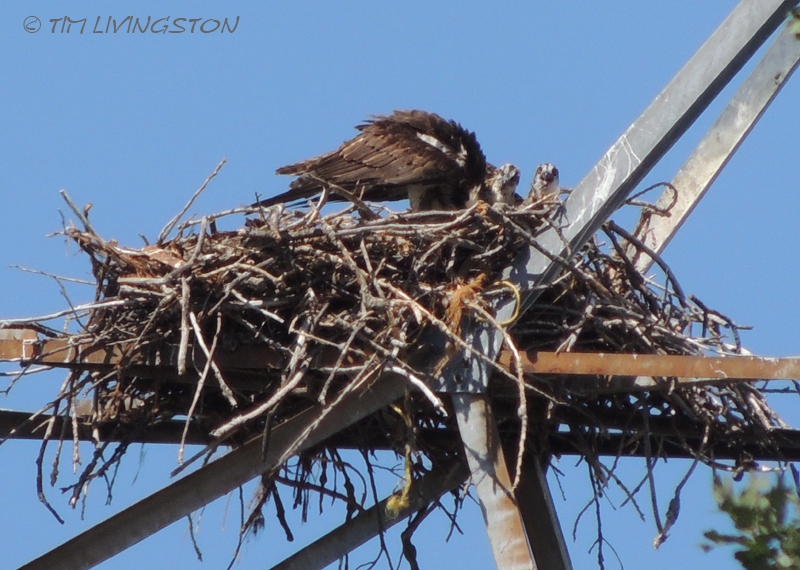 The osprey chicks don’t look much like chicks anymore. They are nearly fledglings. Parent brings a fish. They have grown fast and eat the fish on their own. Careful where you stand while taking pictures. Projectile poop keeps the nest clean. Sorry, didn’t see you there, hehehe. Wing exercise is important preparation for that first flight. 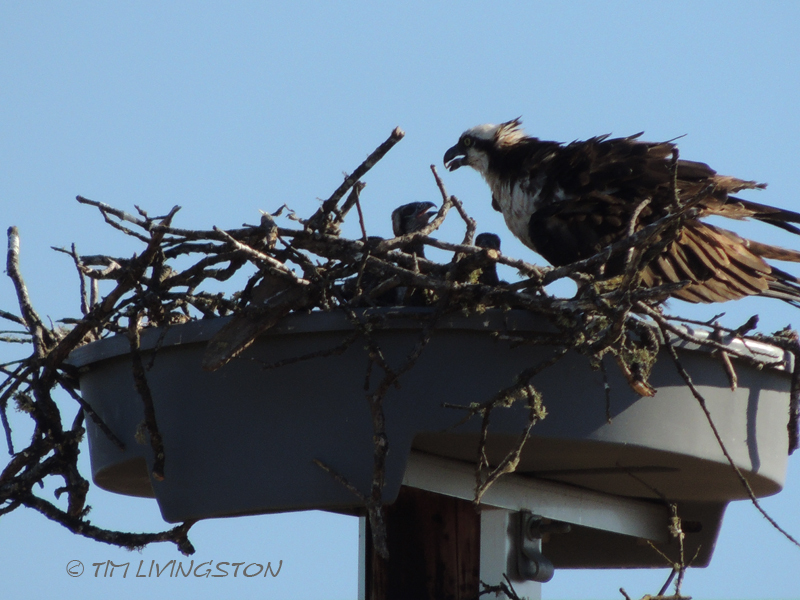 The osprey parents are constantly flying in and out with fish. 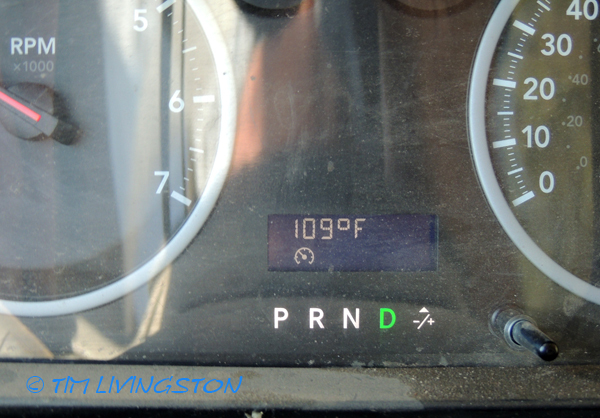 We hit a hot spell a little while back, 109 F one day and 111 F the next. 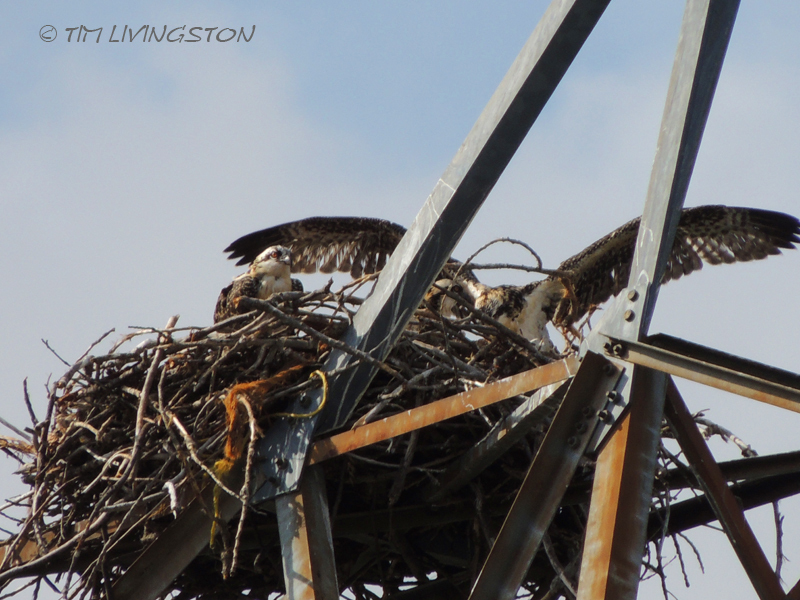 Osprey will fluff up their feathers and pant like a dog in the heat. 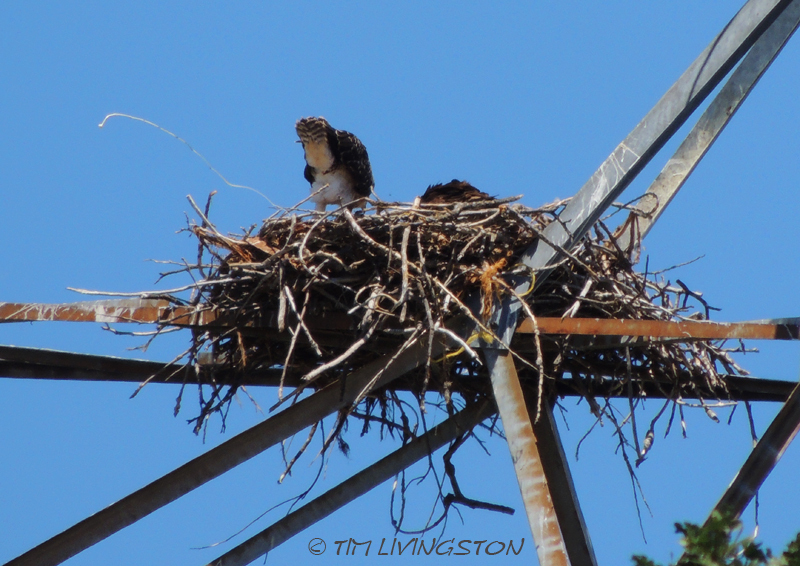 When it gets that hot one of the osprey parents will stay in the nest and shade the chicks. It’s really hot on the tower. 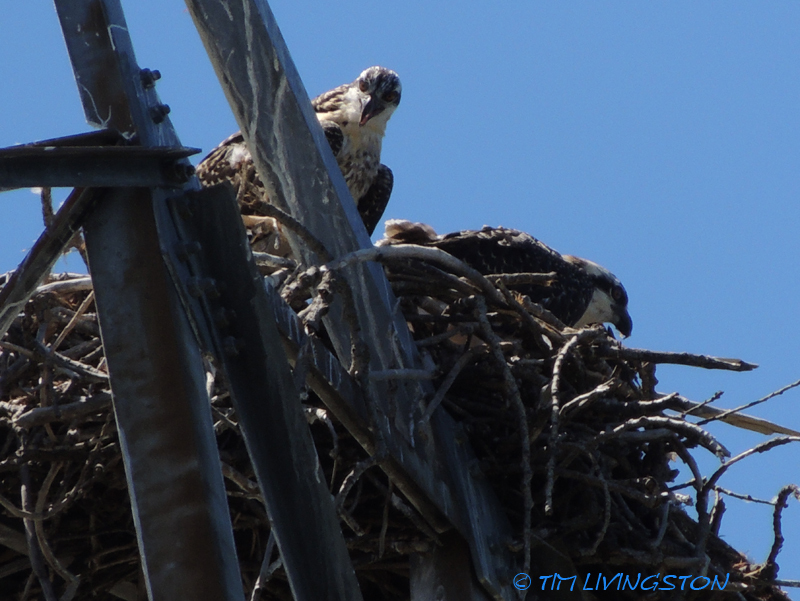 This hot neighboring osprey shades it’s babies. 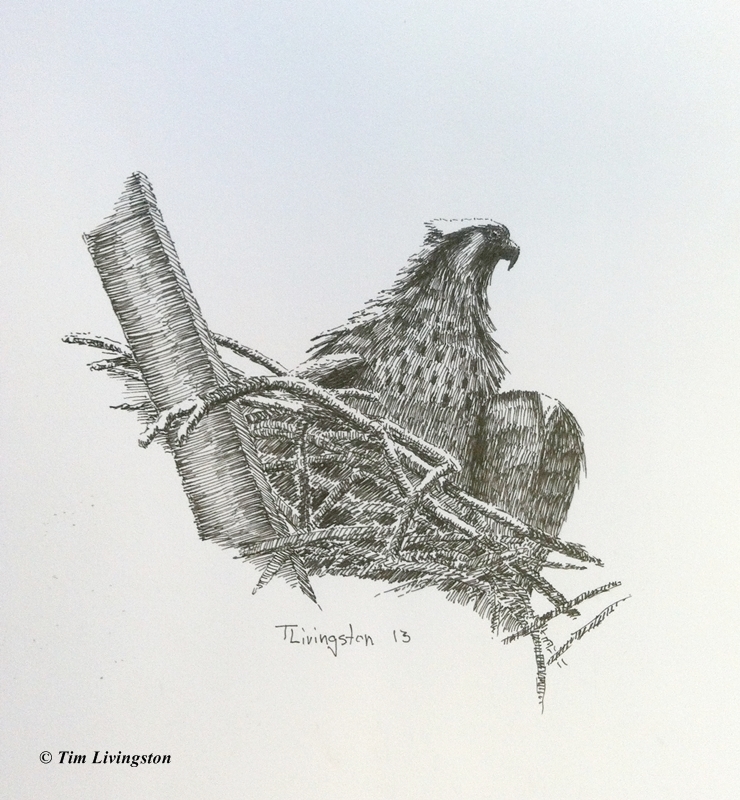 This entry was posted in Wildlife, Wildlife At The Mill and tagged art, drawing, Forester Artist, nature, osprey, pen and ink, photography, wildlife by foresterartist. Bookmark the permalink. Awesome sketch, Tim. I was looking forward to an update on these, thank you. Thank you Scott. I think very soon they will be leaving the nest. Your osprey family makes an interesting album. Thanks for sharing the memories with us. The header image and the osprey drawing are incredible! It’s been so great to watch them, thanks to the work you two have done to keep us updated! Why, thank you so much Z! The sketch is really beautiful. You are fortunate to be up close and while not quite personal 🙂 these birds have given you a trememdous gift of being able to share the nesting pair and their off spring with your readers. Thanks so much Tim. Tis wonderful for all. It has been fun to follow them along with all of you. Fortunately, they are so convenient for me to keep an eye on. I do worry that they will do something spectacular on the weekend when I not around! They do nest in snags, but they are such opportunist that they like any tall structure near a good fishing hole. 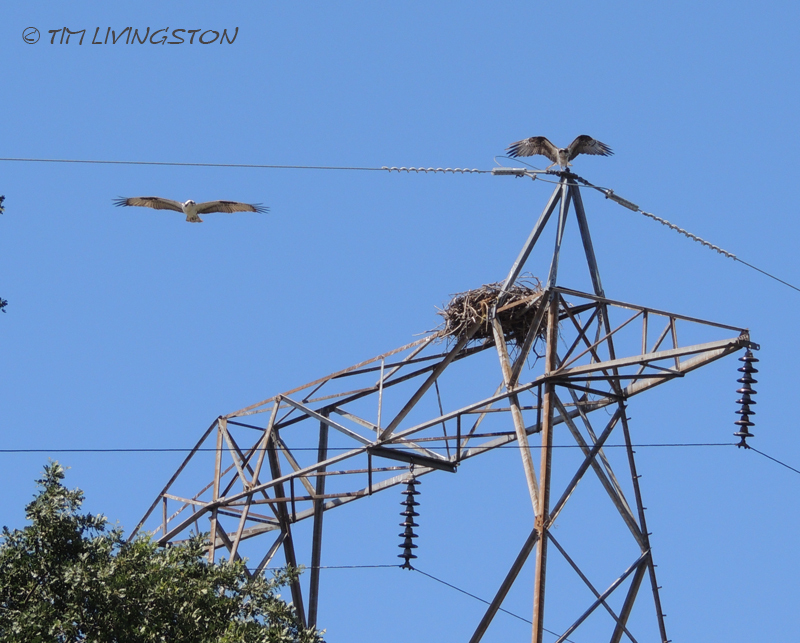 I have photographed a lot of different osprey nest around Northern California. That will be a future post. As for the projectile poop, go look at this post I did a while back, in case you didn’t see it before https://theforesterartist.com/2013/03/15/osprey-complaint-department/. Heck thats HOT . phew feel myself melting .. I know what you mean. I expect them to fledge any day now. It’s supposed to get really hot again this weekend and next week. That might coax them out of the nest. Awesome drawing! I spent a few years in Florida and saw osprey daily. They are very cool birds. They nest in some odds places. One pair had a nest in a hwy sign. Projectile poop was always a concern to me in a convertible! 109F. Wow, I just had a hot flash! It is supposed to be 105 today and reaching 112 by next Tuesday. More hot flashes to come! I took a lot of pictures this year of other local nests that I will post. They do pick odd places indeed. Thanks Rik, that means a lot from you. Wow fantastic drawing Tim and love the update on the little ones. Actually not that little any more – poor things they have to be roasting up there @ 109! I know, they get big so fast! They are going to get real hot again starting today, 105. By Tuesday they say it will be 112! Time to fledge. whoa that is too hot – it will be 103 here today that will sound refreshing to you on Tuesday, lol! Those little guys need a cool bath, a little pool of water to cool them down. They have a big honkin’ river downstairs. They just need to fly down there. 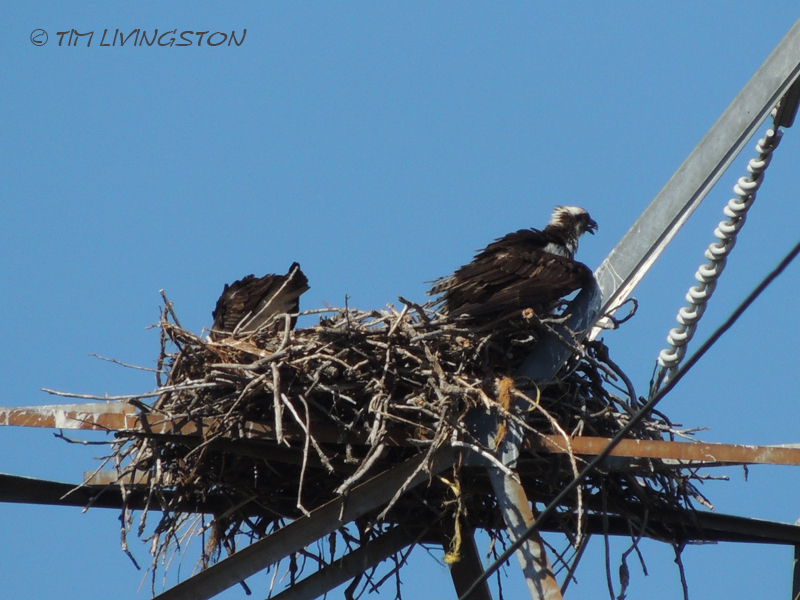 The youngsters are hovering above the nest today, so maybe they’ll be out by the weekend. It’s so interesting to follow this osprey family, thanks for sharing all this, and your great drawings! So what can you expect when the young birds are big enough to move out, would they settle somewhere nearby, or more likely move far away from their parents and disappear, beyond the reach of your camera? I’m not sure where they will go. I imagine they will fish up and down the river with their parents for the Summer. Then they migrate away in the Fall. I expect they will return and nest in the vicinity, but I don’t really know. Thank you Katleen. I expect soon they will be out of the nest! Excellent drawing, Tim! I love following this family through your photos and writing about them. I learn things I did not know. Fantastic and thank you. Thank you Leslie. I think the youngsters are about to leave the nest. Today it was 110 F here so I think they will be motivated. Thanks Zest! More flight pictures coming. Hi Tim, what a beautiful family, thanks for these pictures. Your drawing is great and I love your new banner. Thank you so much. I really appreciate you kind words. Amazing ink image! Wonderful feathers and texture! Egad, that heat! I hope you (and the birds) don’t suffer too badly. So neat that you got to watch them grow up! Thank you Cindy. It is supposed to hit 111 F today and 112 F tomorrow. The entire family was in the tower this morning. I keep expecting the youngsters to fly down to the oak trees by the river. They are at the age that they should fledge any day. I worry about them when it get this hot. 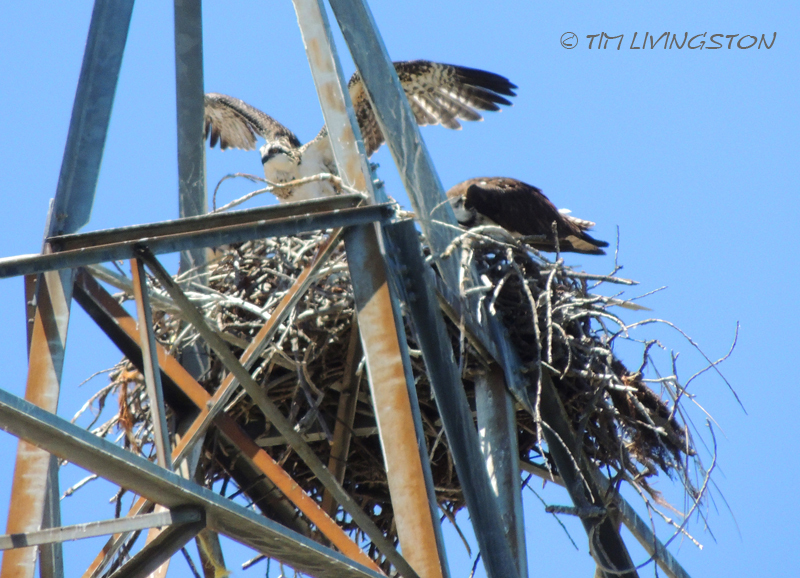 I have live cams for ospreys and red tailed hawks, on one of my blogs…of course I’m sure all the young ones have fledged by now…but it was so interesting to watch them as they were growing. Thank you for stopping by!! Happy to do so, nice to meet you Theanne. Incredible sketch of the Osprey. I didn’t realize that they panted like that. I think it’s really wonderful how they shade their young from the heat. Thank you again Kira. I didn’t realize they panted or shaded their you until I watched them this season. Heat is such a big issue here in Northern California. I’ve been following along and wish you good luck on your journey. May you have success in your future. I’ve been hearing about the horrific heat out there. It has been awful this year. The Griswold chicks are growing up! They are so cute. Great photos! I checked for them the other day and they were gone. I think our heat motivated them to find a cooler perch. It would motivate me! Heat would do that to me, too! Ya, them throw in an adult beverage. Tim, wonderful sketches. You have such an eye for beauty and detail (hence you’re an artist!). I love the photos in between, too. Thank you so much. You are way too kind. Why thank you Perky. I remember Mutual of Omaha’s Wild Kindom when I was a kid, loved that show. Your drawing is wonderful and the photographs are fabulous. thank you so much. Beautiful birds. Well thank you! I’m so glad you enjoyed the post.